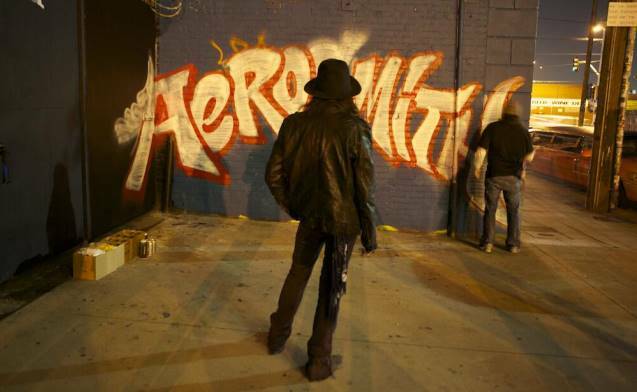 AEROSMITH and Slash last month announced that they will team up for a 2014 U.S. tour this summer. The two acts revealed the joint road trip, dubbed "Let Rock Rule", via a series of tweets on March 21 from Slash and members of AEROSMITH, although dates and venues have yet to be finalized. Ahead of the tour's official announcement — which is expected to take place on Tuesday, April 8 — there has been some interesting activity happening in downtown Los Angeles. Check out photos and video footage below. Slash is currently working on his third solo album with his band MYLES KENNEDY AND THE CONSPIRATORS. The follow-up to 2012's "Apocalyptic Love" is expected to arrive in September. Singer Myles Kennedy, who has been on tour with his other band ALTER BRIDGE, recently tweeted that he had entered the studio to begin laying down vocals for the disc. AEROSMITH released its first set of all-original material in 11 years, "Music From Another Dimension! ", in 2012, and toured for much of the year after its release. Perry recently revealed that he will publish his autobiography this October, titled "Rocks: My Life In And Out Of Aerosmith".